Your first garden should be flowers. Easy flowers. 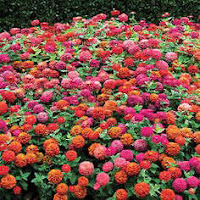 Find a pack of seeds called "Cut and Come Again" Zinnias. Dig up a spot in the sun, a safe spot, and add some potting soil if the dirt looks too sandy. Dig and mix, and, dig and mix again, until you have something that seems like crumbled brownies. Once your soil is ready, smooth it with board or a rake. Place a line on the soil by pressing a ruler into it. Tuck seeds into the soil and pat the soil on top. The seed package will tell you how far apart and how deep to plant the seeds. Remember, this is nature and it doesn’t have to be perfect. Let the seeds rest there and with a fine spray of water, held a few feet away, gently mist the soil each day. Don’t disturb your seeds. Give them time to grow. When you cut the flowers you will notice that they look great in all kinds of containers. Like the little green pitcher you saw at the thrift store. Also: Look for "State Fair" Zinnia seeds. I recommend an online site called Pumpkin Nook for cheaper seed prices. However, Dollar Tree sells seed too. Go and look at them first. The next flower to plant if you have a fence, shed, or a pile of debris in the sun, would be "Grandpa Ott’s" Morning Glories. Soak the seeds in warm water for an hour. Rub each seed on a nail file or emery board. After you get a little flat spot, plant the seeds about two inches apart along a fence line. Leave them and let nature take care of them. Here again, the seed package will tell you how deep to plant. These are the most gorgeous color of morning glory you will ever see. In late summer or fall, harvest the seeds, leave them in a dish on top the refrigerator for a few weeks. Then, put them in envelopes and keep them in a drawer. In the spring, plant them again. Cut a length of your (blooming) morning glories and put both stem ends in water to use your vines in a vase. Also: Look for Moonflowers (they are vines with large white blooms that only open at night). Moonflowers can climb strings on cup hooks around a doorway and glamorize a less than wonderful back yard. The next thing you must grow is food. Cherry tomatoes are the best thing to start with in my opinion. Buy tomato cages at your local home and garden store, and buy cherry tomato plants, assorted kinds if you wish. Tomato cages even come in colors these days and three to six plants are sufficient for your first garden. Buy one cage for each plant. Ask the garden clerk for planting tips, or you can look it up online. The most important thing is that you must plant them in bright sun. If the front yard is the only full sun place in your yard that is okay too. You will have so much satisfaction eating your homegrown tomatoes all summer and cutting them in half to top salads. Taking them fresh in baggies to school or work is very rewarding. Cut them in half and heat them in a skillet to add to your pasta or pizza toppings. Cut them in half and toss them into the bacon grease when you fry an egg. They are so good! I order my garden plants from Park Seed. A Cherry Tomato 6-plant assortment costs about $15. These should provide me with lots of tomatoes all summer. Because I know I will have too many I may also purchase a food dehydrator and have my sunshine all year long. Or, I can cook the excess up into a sauce and freeze in baggies for future soups and pasta sauce. After you have mastered these three: Zinnias, Morning Glories, and Cherry Tomatoes, you can go on and plant ANYTHING! Copyright © 2015 by Susan of Atlanta. All rights reserved.